These homemade flavored butter recipes from scratch are a must to have when cooking or grilling. From savory butter recipes for meat and seafood to sweet butter recipes for waffles, toast, pancakes and muffins. What a difference it makes. 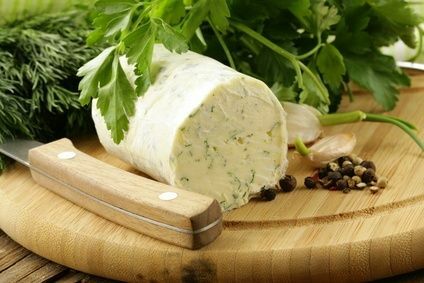 Butter creamed with flavorings such as mustard, curry powder, basil, garlic, herbs or cheese can be used as a spread for sandwiches and crackers, or cut into slices to melt on top of steak, fish and other foods. Cream 1/2 cup butter with 2 tablespoons of finely chopped parsley, freshly ground white pepper and 1 tablespoon of lemon juice - beaten in little by little. Add salt to taste. Form butter into a roll approximately 1 inch in diameter and cover in plastic wrap and chill until firm. Serve in slices on grill or broiled steak, chops or fish. Cream 1/2 cup of butter with 2 tablespoons of homemade Dijon mustard and 1 tablespoon of chopped parsley. Add salt and freshly ground white pepper to taste. Use as a spread for ham or roast beef sandwiches or form into a chilled roll (see above), and serve on grilled or broiled steak. Cream 1/2 cup of butter with 2 tablespoons of chopped fresh tarragon. You may also use 2 teaspoons dried tarragon mixed with 2 tablespoons of parsley. Blend in 1 tablespoon of lemon juice. Add salt and white pepper to taste. Use as a spread for chicken sandwiches, or form into a roll (see above) and serve on grilled/broiled fish or chicken. This is my favorite flavored butter recipe because this butter goes with so many things it would be impossible to list them all. I make up triple batches, making them into logs and freezing them. That way they are on hand at a moments notice to put on fish, slip under the skin of chicken, or melt over a New York strip steak. This is also the best spread for garlic bread. Just slice a loaf of homemade French bread horizontally (lengthwise) and spread on this garlic butter. Bake it in the oven until golden brown. Out of this world! In a bowl, combine the butter, garlic and parmesan cheese. Season with the remaining ingredients and mix until smooth. Here's another flavored butter recipe with a twist. Mix all of the ingredients until smooth. Roll it into a tube and wrap it in the paper from the stick of butter (if you used it). Place in a baggie and keep it in the freezer. It's great for garlic bread, corn on the cob, sauteing shrimp, and roasting chicken. Just slice off however much you need. Boil the wine and beef stock with the green onion and black pepper until it is reduced to 2 tablespoons. Cool. Cream butter and slowly beat in the wine mixture. Add the freshly chopped parsley and season to taste with kosher salt. Form into a roll and chill completely. Cut off in chunks and serve on grilled steak or hamburgers. Stir it into gravies, casserole and pan sauces to flavor them even better. So delicious. I have more than just flavored butter recipes - check out the navigation bar on the left.